Whether your wood fence is brand new or you’ve had it for a while, Pennington Fence is happy to add a protective stain to its surface. For existing fences, we’ll have to do a chlorine wash first to clean the fence. Once this is done, we can apply the oil-based stain. Please note that we cannot stain a fence that has been previously painted. Because wood is a natural material, wood fences will decay over time. Our oil-based stain provides a coating on your wood fence, protecting it from the elements and preventing decay from creeping in. We recommend having your fence stained every two to three years as a preventative measure. Let us know if you have any questions about having your fence stained. Every year home owners across the country spend countless amounts of money on wood privacy & picket fences. 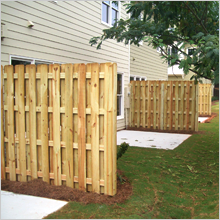 These fences help to enclose the yard, offer a certain amount of security, keep pets and children contained, and give the home owner privacy while in their back yard. With the rising cost of lumber it makes good sense to protect this valuable investment. 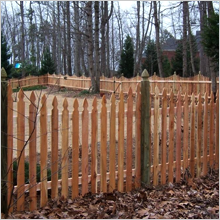 Wood Defender fence stain and sealant works to beautify, protect and preserve the fence. This staining & sealing product keeps the look of the fence aesthetically pleasing while providing a layer of protection to the wood. Wood Defender fence stain is designed and formulated for the single purpose of fence staining. When compared to competitive products that are labeled “universal” the Wood Defender product line is superior in all aspects. This unique modified oil based pigment combination has been tested to provide unparalleled U.V protection. This stain product comes with a 3 year manufacturer’s warranty (on Semi Transparent Fence Stain) or a 2 years manufacturer’s warranty (on Transparent Fence stain). Wood Defender Fence Stains offer a very conservative warranty. It is common for the stain to look good on the fence for up to twice the length of the warranty. The wood Defender Fence Stains are formulated to resist the harmful effects of U.V rays, water damage, severe humidity, and mildew. This means the fence will have a longer life while being protected from nature’s harsh elements. Thanks again, Ron. It was a pleasure dealing with Pennington Fence.